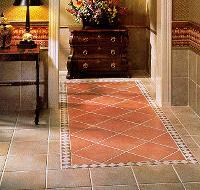 Natural stone tile flooring is no longer strictly for the outdoors. From sun rooms to foyers, living rooms to family rooms, kitchen to baths, natural stone is being used to establish ambience, create stunning underfoot effects and define and separate activity areas. Natural stone tile is available in almost as many styles as clay tile, with polished marble flooring, granite flooring, slate flooring or the very popular travertine, and have become the hallmarks of formal interiors. In choosing any cut natural stone, it's important to make sure it is recommended for floors. Although having someone qualified to install your cut natural stone flooring is more expensive than a DIY project, you may need to seek a licensed professional in order to guarantee yourself the best results. Natural stone, as with any natural product, you can expect imperfections common to the type of flooring you are purchasing. These imperfections only add to the aesthetic appeal and won't devalue your new floor. If you've ever admired the beauty of a stone fireplace, you can begin to appreciate the beauty this type of look can bring to your floor.